A Conductivity, Temperature, Depth (CTD) deployment. The Mid-Atlantic Glider Initiative and Collaboration (MAGIC) currently has three gliders in its fleet, capable of acquiring continuous measurements of the ocean to depths of 1000 meters for months at a time. Researching ocean currents while aboard the R/V Atlantic Explorer. Ocean currents—large and small, fast and slow, shallow and deep—transport water within and across the world ocean in an ever-changing fashion. To capture all of the action and decipher the complex dynamics involved in the ocean’s physical movement, both long-term and detailed measurements are needed. 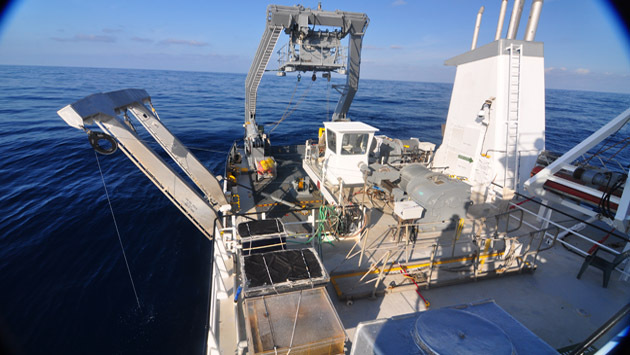 At a location 25 kilometers southeast of Bermuda called Hydrostation S, measurements of the ocean’s physical properties (including temperature, salinity, and pressure) from the ocean surface to approximately 3000 meters depth are acquired every two weeks. Established in 1954, Hydrostation S is the longest-running dataset of its kind in the world. 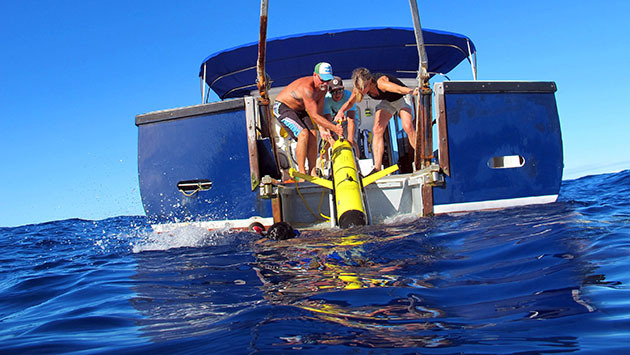 Complementing these long-standing ship-based measurement programs, the Mid-Atlantic Glider Initiative and Collaboration (MAGIC) utilizes autonomous underwater vehicles to carry out detailed surveys of the ocean that can resolve small-scale eddy features. Established in 2014, MAGIC currently has three gliders in its fleet, capable of acquiring continuous measurements of the ocean to depths of 1000 meters for months at a time.